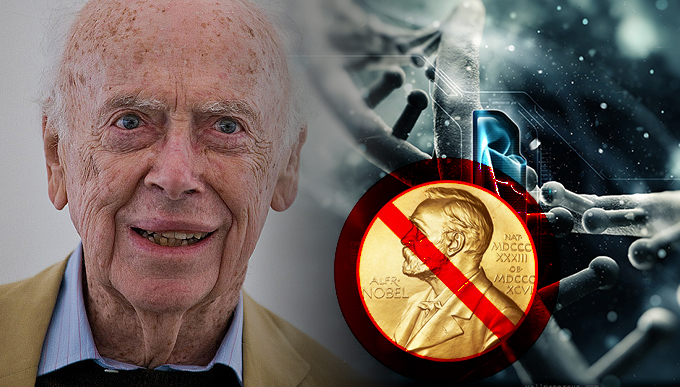 The geneticist James Watson, who has been ostracized since public comments about black African IQ in 2007, is to auction off his 1962 prize for discovering the structure of DNA. It is expected to fetch in excess of $3 million. “Because I was an ‘unperson’ I was fired from the boards of companies, so I have no income, apart from my academic income,” said the scientist of the aftermath of the incident seven years ago, which forced him to retire from the Cold Spring Harbor Laboratory, where he had worked for four decades. “No one really wants to admit I exist,” he told the Financial Times. Despite his reduced circumstances – Watson has not been invited to give public lectures since 2007 – the American scientist is not living his life out in poverty. He said he plans to donate some of the proceeds of the sale of the medal to the “institutions that have looked after me,” including his alma mater, the University of Chicago, and Cambridge, where he met laboratory partner Francis Crick, with whom he shared the Nobel Prize. The 86-year-old Watson also plans to purchase art. The reserve price for the medal, which will be auctioned off at Christie’s in New York on Thursday, is $2.5 million, and there has been speculation that the final value could easily surpass $3 million. Crick’s medal – auctioned off last year to Jack Wang, a relatively obscure Shanghai biotech entrepreneur – fetched about $2.3 million. “The far-reaching aspects of their discovery affect everybody and are only being appreciated now,” said Christie’s auctioneer Francis Wahlgren. “I think the guy is the greatest living scientist. There are a lot of personalities in history we’d find fault with – but their discoveries transcend human foibles,” Wahlgren added. The sale of Nobel Prizes is a recent phenomenon, with Watson’s being only the fourth to go on sale – and the first while the recipient is still alive. The medal awarded to Aage Bohr, the son of Niels, in 1975, attracted a winning bid of about $50,000 in 2012. Notably, American writer William Faulkner’s 1950 medal failed to pass the reserve price at an auction last year. Despite a long-standing reputation as an outspoken scientist who sometimes professed eccentric views – such as those linking sunlight and libido – Watson’s downfall was swift.